Sandra Don-Arthur, founder and CEO of Alexandrina Make-up and reigning Ghana make-up artist of the year 2018, is taking Ghana’s make-up industry to the world as she takes part in the 2018 New York Fashion Week (NYFW) in America. She is the official Maybelline make-up artist at the NYFW. The ace make-up artist, who also won editorial make-up artist of the year 2018 at the Ghana Make-up Awards, is working backstage with Maybelline for shows such as Carolina Herrera, Rochambeau, LaQuan Smith, Naeem Khan and Jonathan Simkhai. NYFW officially kicked off on Friday, September 6 and will end on September 12. It opened with swarms of models, stylists, influencers, creatives, editors and others. NYFW’s schedules are also packed with prestigious designers, including Coach, Michael Kors, Oscar de la Renta, Marc Jacobs and a plethora of other famous faces. Sandra Don-Arthur is representing Ghana and the West African region as the only Ghanaian make-up artist out there. 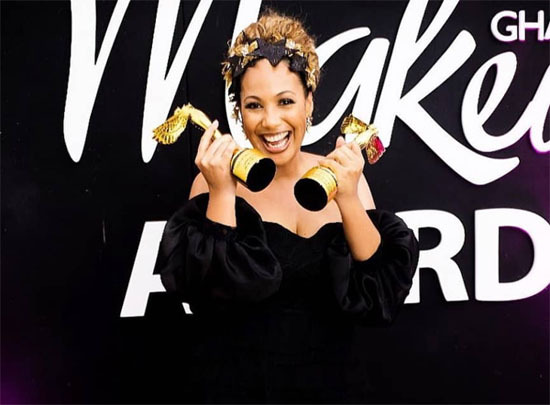 She is currently the reigning 2018 Ghana Make-Up Awards artist of the year and she is obviously enjoying a great career at this moment. She does make-up to suit any skin tone across editorial, bridal, fashion, TV and film. Sandra’s keen eye and innate understanding of colour and technique have enabled her to work with some of the industry’s best. She has worked with top celebrities such as Zynnel Zuh, Joselyn Dumas, Omotola Jalade and a host of others. She is currently working with Maybelline, a world make-up brand.